We'll admit it...our office has something of a sweet tooth. 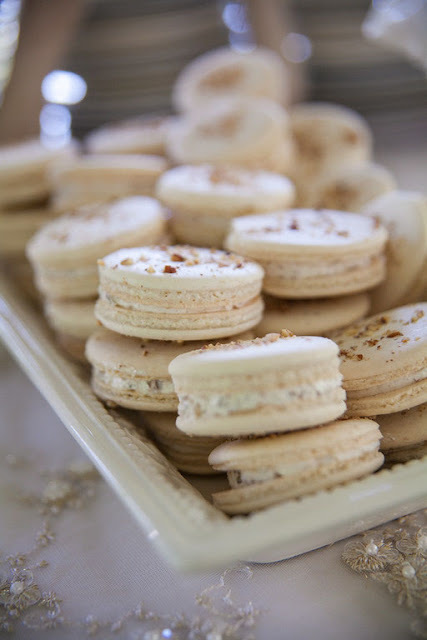 We all really enjoy our sweet treats, which makes today's blogpost that much sweeter! Wedding cakes are a true work of art. They not only have to look good, but also taste delicious. So we want to share our top ten all-time favorite wedding cakes to give you all some wedding cake inspiration! 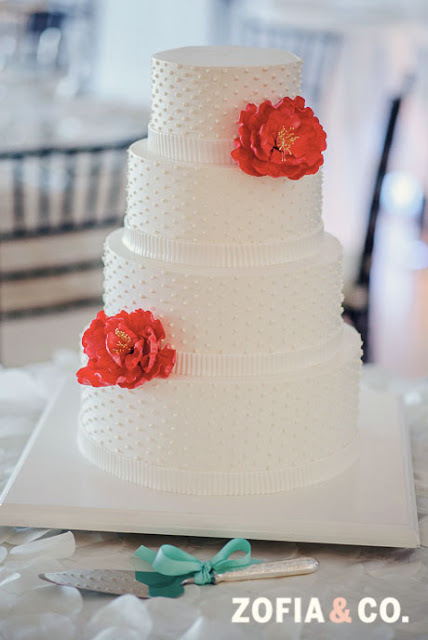 We're starting off our roundup with the most classic wedding cake there is...an all white wedding cake! 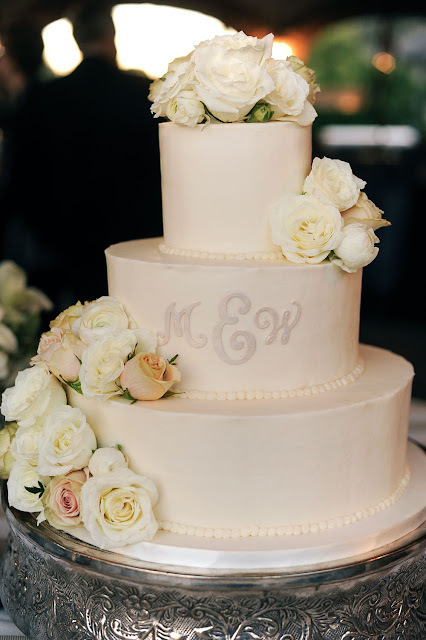 Though neutral in color, this cake's beauty is in the details with it's delicate roses, pearl details, and finished off with the new couple's monogram. 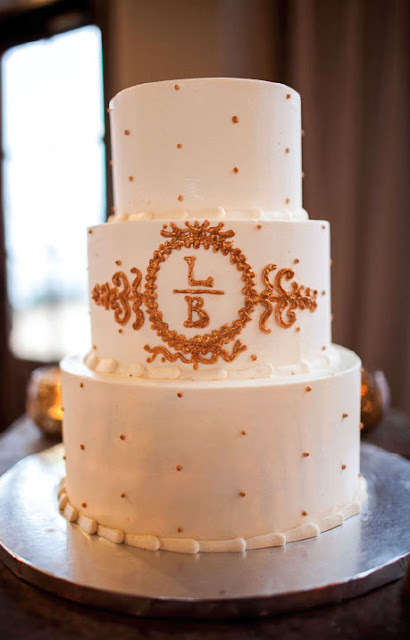 Speaking of monograms, this white wedding cake prominently featured the couple's custom wedding monogram. Drawn in gold icing on the side of the cake, the monogram was paired with simple swiss dots to allow their wedding monogram to shine! This classic wedding cake paired classic wedding cake design (including pearl accents and romantic flowers) with their custom wedding monogram. The couple's wedding colors were navy and coral, so their monogram added a nice pop of color to their romantic wedding cake. Groom's like cake, too! 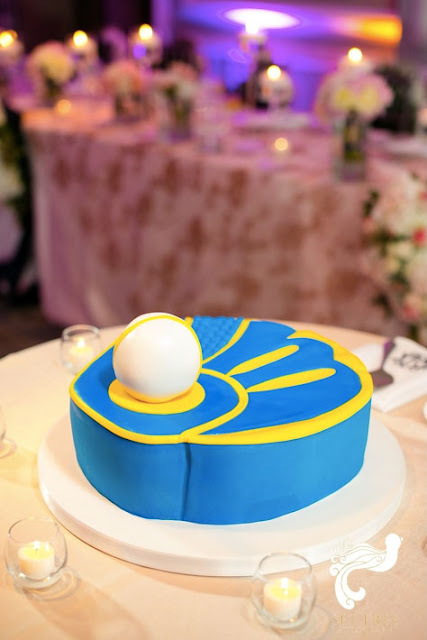 For Kyle's groom cake, he chose to pay homage to his favorite baseball team, the Milwaukee Brewers. 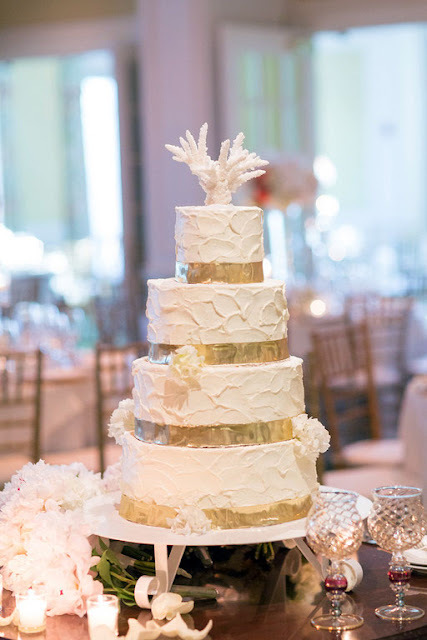 We couldn't think of a better way to pay tribute to this couple's destination wedding location than adding a piece of white coral to the top of their wedding cake. The nautical accent gave their traditionally colored white and gold wedding cake a fun, nautical twist! This coral and navy wedding cake is another example of a nautical wedding cake done right. 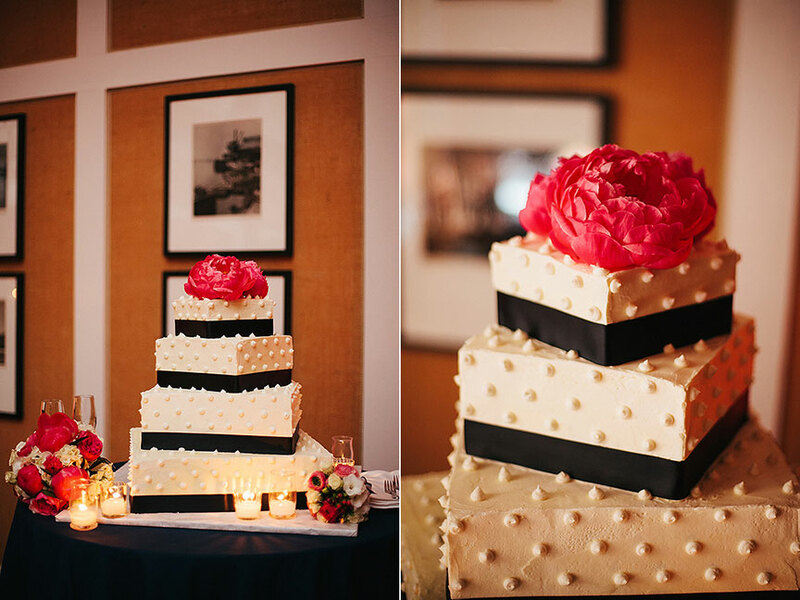 Highlighting the traditional nautical (and Nantucket) colorway of navy and coral, this wedding cake features classical preppy elements (like navy ribbon and swiss dots) and gorgeous pink peonies. 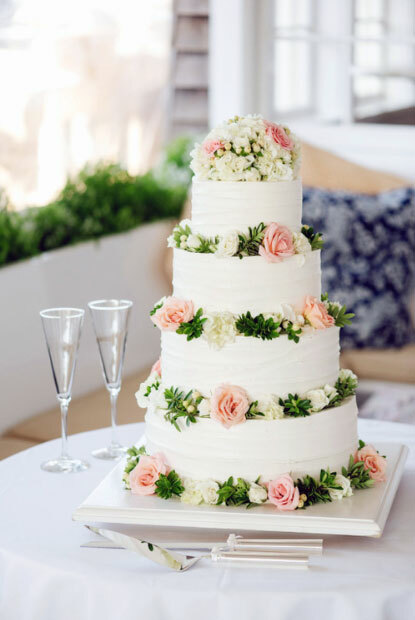 We love seeing modern twists on a wedding cake, and this preppy cake (inspired by the wedding's Palm Beach location) does just that! Nixing the white wedding cake tradition, this cake was turquoise with some amazing white swiss dot detailing that was arranged in a chevron pattern. Definitely a one of a kind wedding cake! 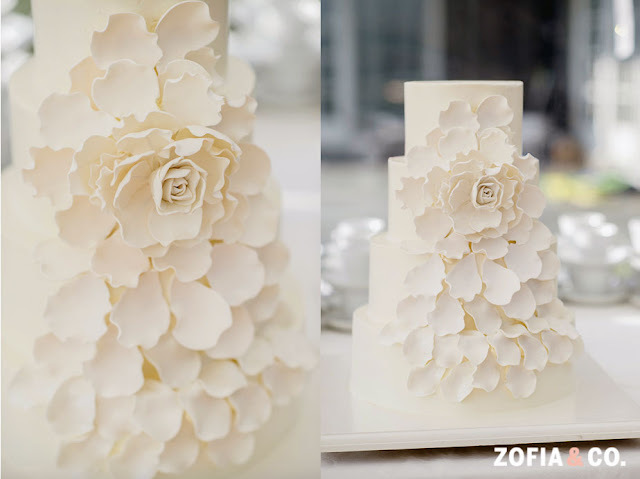 This all-white wedding cake is another one of a kind cake! Featuring architectural decor, this cake's flowers are three-dimensional and bring it's design to a new level of awesome. At N&L, we specialize in creating creating wedding invitations that are traditional, but with a slight modern twist. 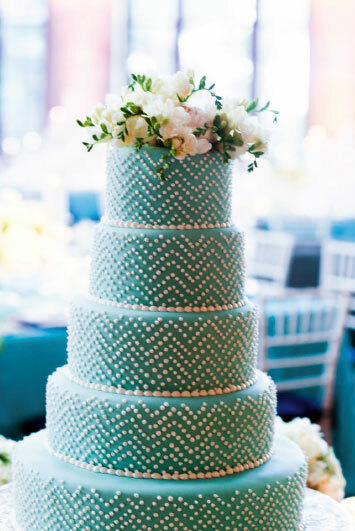 We think this wedding cake is just that! Sticking with a traditional white cake and minimalistic design, this cake features two bright pops of color in the form of fresh flowers. The deep colored flower adds such a fun twist to the classic wedding cake! 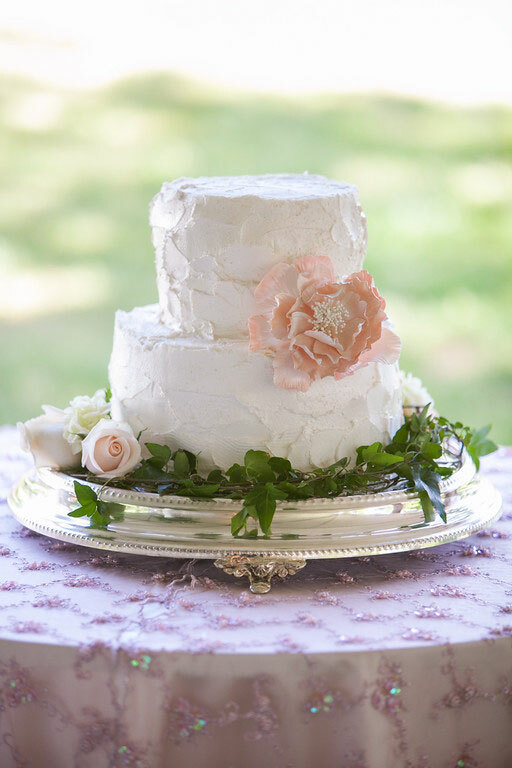 There is something so beautiful about adding fresh flowers to a wedding cake! We love the abundance of pink and white flowers mixed with greenery on this cake. It highlighted the couple's unique wedding color palette of mint and coral perfectly. We saved the best for last! 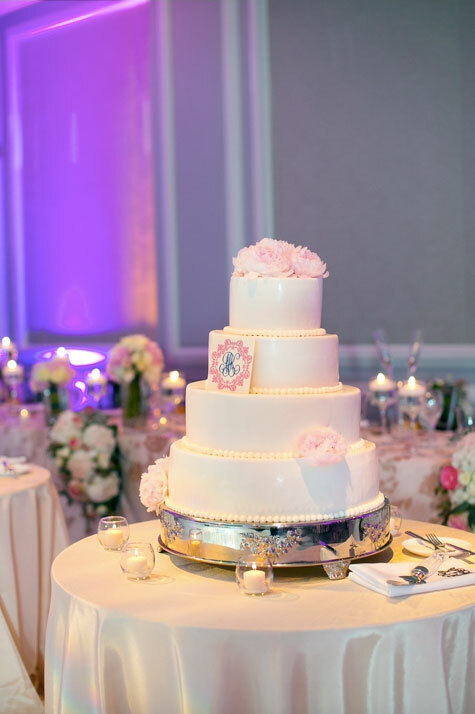 This Southern wedding not only featured a wedding cake, but an entire dessert bar for guests to enjoy. All of the desserts featured a romantic, vintage feel to coordinate with the wedding's barn location. 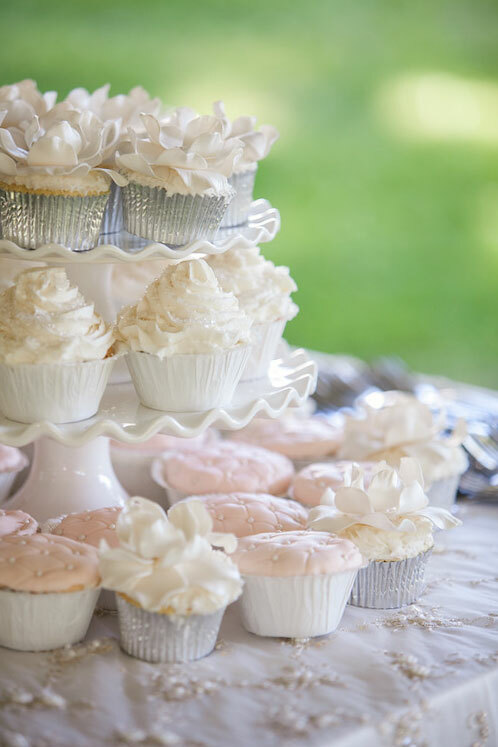 While we love the wedding cake, we actually think their cupcakes are the winner. Featuring a couple different designs, their cupcakes ranged from a quilted top to designs resembling flowers. So sweet! Hope this post as left you feeling extra sweet on this Wednesday morning!! It's the perfect place for a reception -- before or after the event, with plenty of space for people to move around. The wedding venues were large with room for plenty of tables. There is a stage to the right side of the room, where your presenters can be seen or the bride and groom can take their vows.